Sunday was a little less eventful than Saturday. I got held up on the way to the Electric Arena to catch Bangor trio Two Door Cinema Club but managed to squeeze into the packed tent to hear them confidently lash out catchy tunes from their strong debut album in their last festival performance of 2010. 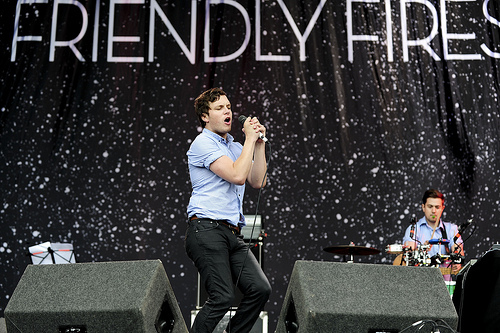 Next it was over to the Main Stage for Friendly Fires who I was eager to see again after one of the most eye-catching performances at last years Oxegen Festival. Unfortunately my revervations about the Main Stage slot were founded, they would’ve benifited from a better setting, the sensible decision would have been to put them on after TDCC in the Electric Arena. A minor complaint I guess as they put on a good show with ‘Skelton Boy’, ‘Diamonds’ and ‘In The Hospital’ were high points. The cheery, upbeat electro-indie vibes of the last two bands were to be soon swept away by awesome rawness of The Horrors, who emerged onto a smoke-filled stage accompanied by a deafening drone leading into ‘Mirror’s Image’, the psychedelic shoegaze makeover is for real and the goth-garage gimmickry is long gone. The swaggering set is mostly made up of songs from the excellent Primary Colours, ‘Three Decades’,’New Ice Age’ and ‘Who Can Say’ are amongst the best of them along with a new track – a very dark, haunting and intense show, hugely memorable, these guys deserve all the recent plaudits without doubt. The festival’s end was nearly upon us but there was still time to see The Fall over at the Cosby Tent. 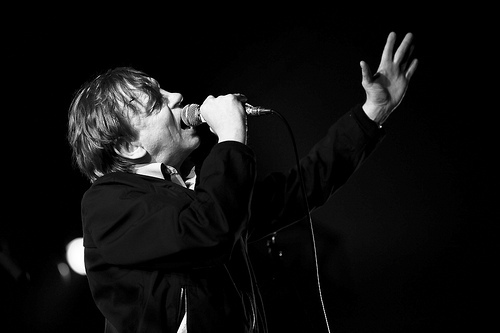 The band’s line-up may continue to change but the enigma surrounding Mark E Smith remains, opening track ‘O.F.Y.C. Showcase’ sees them blast the tent to bits as they await the arrival of a certain someone to the stage, when he obliged the crowd went nuts. I’m not wholly familiar with what is a pretty extensive back catalogue but it was a great gig, noisy and raucous as hell. Mark E Smith is an unusual ‘character’, guess when you’ve done what he’s done you can get away with almost anything. EP is over for another year, great festival, well organized with lots to do apart from music if that’s your thing but next year I think I will leave the bike at home. Enjoyed all your reviews of the weekend. Pity we didn’t get a chance to meet up down there. Thanks man. I wasn’t sure if you went down. I will give you a shout when im up next.